For as long as I can remember, I dreamed of getting married in Italy, the home of my father’s ancestors. The country is filled with magic and romance—particularly in the Tuscan hills. That very region has been beckoning me since I first traveled there in my early 20s. After being diagnosed as gluten intolerant in 2009, I made my first gluten-free pilgrimage there, where I discovered how gluten-free friendly the entire country had become. I was told by numerous locals that many of the children and adults in Italy were experiencing a rise of celiac disease and gluten intolerant cases. So as a country, they adapted. They produced gluten-free pasta, bread, pastries, anything you can imagine, and did so with great pride and pleasure, as is done with all that they create. So from there on out, we set off on a series of wedding-related destination events, including my bridal shower, my bachelorette party, our city hall nuptials, our Tuscan castle wedding, our Venetian honeymoon and, finally, our New York reception. Given that I, the bride, was gluten free, an additional layer was added to our already relatively complex festivities. But it was totally worth it when the final result was beyond our wildest dreams. Given that almost everything involved in our wedding had a travel element, I decided on an April bachelorette bash on Hilton Head Island ahead of our September Italian nuptials. I have spent the last several years getting to know South Carolina and the areas of Hilton Head and Bluffton, and I knew it was everything I wanted in a destination bachelorette party. We had it all: a beach, great weather, amazing rental properties, and the ability to cook our own food and reside in an area that has an incredible restaurant scene with some of the freshest seafood around. Step one was to book a vacation home to house the 14 girlfriends who so generously agreed to celebrate with me. We worked with The Vacation Company to find an incredible property in Sea Pines that overlooked a golf course, complete with our own pool. Step two was ordering from grocery stores and liquor shops to stock up on gluten-free wine and groceries (think Udi’s gluten-free pepperoni pizza and Ian’s gluten-free chicken nuggets for late nights) and a plethora of healthier options like lean meat, fish and tons of vegetables to get us through the trip. Steps three and four included picking our two main restaurants for group dinners out. For an inventive, cutting-edge meal that included a killer cocktail list, I chose Lucky Rooster. Headed up by Chef Clayton Rollison and his wife, Leah, the restaurant has a menu that goes beyond the boundaries of typical Southern cuisine and serves up dishes like the bone-in ribeye with blue cheese butter and red wine au jus and the classic shrimp and grits. Chef Clayton knew what my gluten-free options were ahead of time, and there were many of them. On that evening, I paired my meal with an expertly executed negroni. For our final culinary outing, I wanted the girls and me to have a true Southern experience with a low country boil on the docks of family-owned and -operated Hudson’s. Our group was seated in the old packing room-turned-events space overlooking the water. We indulged in a gluten-free crab and avocado salad to start, followed by the main event: the low-country boil. This naturally gluten-free meal included shrimp, oysters, red bliss potatoes and corn on the cob, all topped off with a healthy dose of Old Bay seasoning. Amidst all the eating, we squeezed in a few other activities, including morning beach walks, in-home yoga, poolside massages and late-night dance sessions down in the BarMuda Triangle. Throughout my childhood, my parents took my sister and me down to the Jersey Shore. It was a short drive from Staten Island, where I grew up, and we loved everything about the area, from its beaches to their local restaurants and great boardwalk activities. So when my mother and sister, Erin (my maid of honor), were deciding on where to host my beach-themed bridal shower, they settled on Jack Baker’s Lobster Shanty in Point Pleasant, New Jersey. From a gluten-free menu perspective, planning was a breeze. The gluten-free guests were given beautifully grilled salmon, vegetable medleys and baked potatoes, with a side of homemade tartar sauce. For dessert, we opted for everything to be gluten-free. We started with an ice cream sundae bar in the back of the room, and right up front and center were platters of fruit and Trader Joe’s gluten-free mini cupcakes and trays of Amoretti cookies from Bruno’s Bakery in Staten Island. The main event was a “cheese cake” comprised of three wheels of gourmet cheese piled high from Murray’s Cheese in New York City, assembled by my mom and bridal party. They delicately placed strawberries and blueberries surrounding each layer to make a stunning display. My guests marveled at the beauty of the structure itself and didn’t even realize they were missing a gluten-filled cake. Everyone was happy with their savory and sweet ice cream and cheese plate. My parting gift for our guests was a pretty bag of homemade organic blue sea glass candy created by my college roommate and bridesmaid, Katy, a perfect complement to my bridal beach bash. Ahead of our Italian nuptials, we were encouraged by our monsignor in the United States to make it legal in New York City ahead of our wedding in the Catholic church in Tuscany. Being tried-and-true New Yorkers, we thought there was something so romantic about getting married legally in our beloved city. So, late on a Friday in the middle of August, we invited both sets of our parents, and we took a number down at city hall in Manhattan. We were married within the hour and were on our way to celebrate at one of our favorite New York City Italian pizza spots: Adoro Lei. We reserved the party space to invite a few of our closest family and friends to share some pizza and wine with us. Partners Michael DiBugnara and Chris Feeney have been perfecting their gluten-free pies for quite some time and offer two styles: Neapolitan and New York, both gluten-free. We had Chris fire up several gluten-free pies (baked in a dedicated gluten-free oven) as well as some regular pies and salads for our group and paired them with outstanding Italian red and white wine. For dessert, my aunt surprised us with a gluten-free wedding cake, which she brought in from Tasty Pastry Shoppe in Brooklyn. It consisted of white cake, cannoli cream filling and a whipped cream outside. Our actual wedding was not just a one-day affair. Rather, it was a three-day weekend extravaganza. We hosted 80 of our friends and family at Castello di Montegufoni, a historic castle located in the town of Montespertoli, in the heart of the Tuscan countryside. We had a weekend of events scheduled, including a welcome barbecue, a relaxing yoga class, a guided wine tasting and pizza party, a lasagna dinner and a wedding day complete with an hour-long Catholic mass with our two bridal party cantors, Dino and Joanna, a garden aperitivo accompanied by a cellist and violinist, a three-course meal under the stars and an evening of dancing and after-dinner cordials in an underground cave. Our planning centered around my dietary needs. We had a few other guests who were also gluten free, so it was easy enough for the castle to prepare all of our meals. Every buffet breakfast had hard-boiled eggs, gluten-free pastries and bread, fresh fruit and yogurts. For all our lunches, there were gluten-free pasta options alongside gluten-free pizza made to order and delicious gluten-free sandwiches (read: Italian tuna salad all the way). The staff at the castle understood my needs from the beginning, and they so kindly provided me with a pre-wedding tasting comprised of six different gluten-free pastas for our wedding menu. When I met with the chef and understood all the work he put into making sure I was kept well-fed, I knew we had found the right wedding venue that could execute everything I needed. Our welcome barbecue was a dream for a gluten-free individual. We had a variety of meats, cheeses and melons to begin with as well as simply grilled meats topped with salt, pepper and olive oil. For dessert, we offered fruit alongside a lovely spumante. We also paid special attention to the wine we served. For white, we cracked open a double magnum (a 3-liter bottle) of Ferrari’s Perle sparkling wine, which a friend of ours in the wine industry so expertly sabered off with a cake knife. For our red wine drinkers, we had an amazing Toscana Rosso Amore & Follia from Podere Le Ripi, an organic Montalcino wine producer that we’ve come to know and love. We weren’t done with the red wine just yet, and we saved our Balthazar (a 12-liter bottle) of the good stuff for our rehearsal dinner. We began with traditional Tuscan appetizers: meat, cheese and bruschetta (on gluten-free bread) and then moved on to two different kinds of lasagna. One was a traditional meat-filled one, the other with a béchamel sauce. The chef prepared both versions gluten-free as well, prepared in individual dishware. We ended the meal with a tiramisu where they also made a gluten-free version for me. By the time the actual wedding day was upon us, we were stuffed. But we knew we had to save room somehow. Following our church wedding mass, we hosted a traditional Italian aperitvo in the garden on the grounds of our castle. While some of the cocktail hour items did contain gluten, there were naturally gluten-free items throughout the garden, such as Italian meats, cheeses, grilled vegetables and olives. For the sit-down dinner, we began with two different types of pasta (both available gluten free) including a gluten-free ragu over penne and a pecorino pear ravioli. Following the pasta course, we served a traditional Tuscan steak with a side of potatoes, vegetables and salad. Included in our wedding package was a traditional Tuscan wedding cake that did have gluten, so I decided not to have a separate wedding cake for me. Instead, I had something that everyone could enjoy: a gelato cart. I choose four flavors that were gluten-free: pistachio, stracciatella, hazelnut and lemon sorbet. The cart was a great way for our guests to transition into the dancing portion of the evening. The morning after our wedding, we packed up our car and drove to the Venice airport, where we were picked up by the concierge from the JW Marriott Venice Resort & Spa. We were taken by private boat to the beautiful, grand entrance on the property’s private island, where we settled into a romantic junior suite. After a quick costume change, we were on our way to the property’s gourmet restaurant: the Michelin- star Dopolavoro Dining Room, a true culinary tour de force. Given the high level of quality and service at this Italian oasis, being gluten-free was never considered an issue. After a refreshing aperol spritz, we settled into a quiet table where we chose a five-course tasting menu with wine pairings. All of my dishes were modified to suit my needs, each dish more innovative and flavorful than the next, with fresh gluten-free bread out of the oven any time I wanted a nibble. The next day, we spent the afternoon at the property’s Sapori Cooking Academy, where we were greeted by the jovial chef Luigi Delia, who created an entire gluten-free cooking lesson just for us. We spent four hours with the chef, crafting a classic Venetian menu with a gluten-free twist. We sliced up beautiful rings of fresh calamari, smelled the incredibly fresh produce from the bunches of vegetables that arrived in the kitchen and even selected the most perfect squash blossoms that we would later stuff with homemade cheese and coat with gluten-free batter. Chef Delia walked us through his favorite types of gluten-free flours and which ones he prefers for baking or frying. We saw the nuances first hand when we baked a variety of gluten-free loaves and fried beautiful nuggets of polenta and calamari to go in our fritto misto plate. With our appetites satiated and armed with newfound culinary knowledge, we spent the rest of the afternoon relaxing at the JW Marriott’s GOCO Spa Venice, where we received a couples massage and enjoyed the heat and water facilities. With that extra pep in our step, we were onto our next culinary adventure, this time on yet another private island at the San Clemente Palace Kempinski Venice, a Leading Hotels of the World Property. We arrived just in time to have a cocktail overlooking Venice, watching colorful gondolas and boats glide by in the distance before settling into our perfect table for two at Acquerello Restaurant, located on the grand lawn facing the water. Then we were in the hands of Chef Giorgio Schifferegger, who crafts a menu night after night that is reminiscent of the beautiful sights and sounds that surround him on the property’s own island. The service was outstanding from the moment we sat down and I mentioned that I was gluten free. Not to worry, I was assured on multiple occasions, as the delectable experience began to unfold before us. We tasted a beautiful array of appetizers, including a rich and creamy foie gras with gluten-free bread. For dinner, we indulged in artfully crafted beef that melted in our mouths, followed by a gluten-free chocolate peanut butter dessert that had me speechless. If the city hall and Italian nuptials weren’t enough, we decided to celebrate—one more time—with our friends and family who weren’t able to join us abroad. This time around, we chose to revisit my hometown of Staten Island for our wedding reception at The Historic Old Bermuda Inn. Since Italy was a three-day, multi-course, magnums-of-wine kind of experience, we were looking for simplicity: a scrumptious yet casual dinner buffet and great live music. The staff at the Old Bermuda Inn intrinsically understood what we were looking for. We chose a cocktail hour with passed hors d’oeuvres and a buffet dinner that was filled with an abundance of proteins and Italian comfort foods that would be great to eat in between dance numbers. They prepared a special gluten-free menu for me that included gluten-free penne topped with vodka sauce; sliced, tender prime rib; and a plate of grilled salmon, a baked potato and steamed vegetables. This was the time for us to really enjoy ourselves when it came to music and entertainment. We walked into beautiful bagpipe music to celebrate my Scottish and Irish heritage, and danced all night long to a well-known local band, Screaming Broccoli, which played the best of the ’80s, ’90s and all of our classic rock wish list. A little gluten-free planning went a long way in the case of our wedding and all of the events surrounding it. Every moment of each experience, I felt special and well taken care of. I never had to worry or get stressed; I only enjoyed and savored each moment. 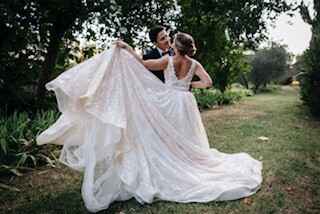 Planning a gluten-free wedding for myself wasn’t an easy feat, but the year-long preparation and attention to detail resulted in one of the most magical years of my life, a true fairy tale from beginning to end.